A critical challenge for those delivering social housing infrastructure is how to effectively demonstrate the value of investing: from a whole-of-government perspective, for the community and for the private sector. Questions of economic viability and benefit to society need to be addressed. This requires the identification and measurement of both economic and social benefit, on which to build an evidence base for the renewal of public policy and public confidence. Valuing Social Housing aims to provide those delivering social housing with evidence and insights to clarify the purpose and desired outcomes of social housing provision in a fiscally constrained and changing environment. This is occurring at a time when social housing infrastructure is aging, is inappropriate to current needs and only available to those in critical need. How then, can the value of building and maintaining our social housing infrastructure be better understood, defined, quantified and communicated so that a defined economic and social return on investment can justify on-going investment in this sector? This research builds on the outcomes of SBEnrc Project 1.31 Rethinking Social Housing (2014-15), to establish a broad-based rationale for investment through: developing a comprehensive indicator set across housing and non-housing objectives; identifying associations and causal links; and capturing return on investments. This will be done in the context of the benefits gained from providing secure homes to both individual and national productivity, to tenants, to the broader economy, to governments through extra revenues, and to the environment and community. Secure housing often means we are healthier (and need less hospital and medical care), that we work better and contribute more to the economy, and that family and community life is likely to be much improved. But how much is all that worth? This is an ambitious undertaking. Feedback from industry and researchers indicates that this is relevant and beneficial research which fills a critical gap in both knowledge and practice. In previous work, a conceptual framework was developed identifying the productivity benefits of ensuring secure housing for all, to better enable productive participation in family, community and working life. 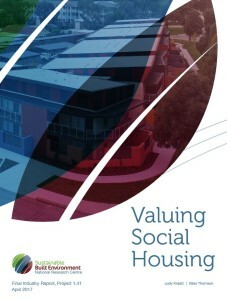 This project will develop a fully validated decision support and policy guidance framework to demonstrate true social housing value by (1) testing housing and non-housing outcomes across nine objectives: community, education, employment, environment, economic, health & well-being, housing infrastructure, social engagement and urban amenity; (2) determining causal links between outcomes and indicators; and (3) developing the methodology and values associated with return on investment (economic and social), and identifying to whom the return on investment flows. This project will deliver a decision support tool to evaluate the performance of social housing policy and delivery activities, validated through pilot case studies in different states. Identifying and costing the direct and broader social impacts will provide benefit to governments, housing providers, investors and the community, through capturing the externalities currently unaccounted for.